As soon as the air begins to chill and the weather turns from tolerable to a tad bit too chilly, a certain magical something happens. In super markets all around the United States, the refrigerator section becomes stocked with all sorts of variations of everyone’s favorite holiday drink—eggnog. This ultra-sweet, super rich and thick tastes like the holidays. It really does. Enjoyed by the young and the old alike, there’s something nostalgic about the taste of eggnog. So, we set out to capture that incredible holiday flavor in dessert form. Behold, these sensational eggnog cookies. Complete with a bourbon vanilla icing, these cookies are deadly good. With the perfect blend of sugar and spice, nothing would make Santa happier than leaving out a plate of these on Christmas Eve. Whip them up for your family get togethers, holiday parties or just because you deserve it. 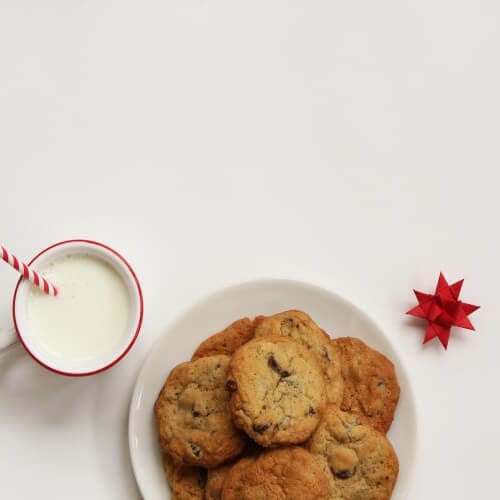 Eggnog cookies. Is there anything more to explain? Learn how to make them with our online culinary school host in this fun and festive tutorial! 2. In a medium mixing bowl, whisk together the dry ingredients: flour, baking powder, salt, nutmeg and cinnamon until free of any large lumps. 3. In a large mixing bowl or the bowl of a standing mixer, cream together the butter and both sugars until fluffy-about 2 minutes. Add in the egg yolks one a time, mixing well before you add the next one. Add in the vanilla, rum extract and egg nog and beat for an additional 1-2 minutes. Using a ¼ measuring cup, slowly add in the dry ingredients to the wet. Mix until just combined. 4. Using a tablespoon, scoop out dough and space about 2 inches apart on baking sheet. Bake for about 10-12 minutes or until cookies are very lightly golden brown. 5. While cookies are baking, make the frosting. Cream together the butter and vanilla extract until light and fluffy. Add the bourbon and salt and mix thoroughly. Using a ¼ measuring cup, slowly add in the powdered sugar until all is incorporated. Frosting should be light and fluffy, not runny or melting. 6. When cookies are done, remove from oven and let cool on baking sheet for at least 5 minutes. Transfer to wire rack and let cool completely. When cooled, add frosting and sprinkle with a pinch of nutmeg. Enjoy!